Known as "Chief" Anderson by the pilots he trained, Charles Alfred Anderson was a pioneer of African-American aviation. A commercial pilot, he and Dr. Albert E. Forsythe were the first African Americans to fly a transcontinental trip from Atlantic City to Los Angeles and back in 1933. The two later flew a goodwill flight to Cuba, Jamaica, Haiti, and six other Caribbean countries in their plane named The Spirit of Booker T. Washington. Anderson taught civilian pilot training courses at Howard University, Washington, D.C. In 1940, he joined the faculty at Tuskegee Institute as head of the Civilian Pilot Training (CPT) program. 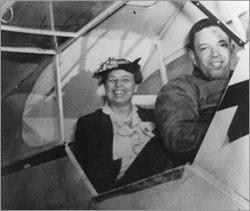 Chief Anderson gave Eleanor Roosevelt a plane ride when she visited Tuskegee in 1941. She was determined to counter the view that African Americans couldn't fly. Their photograph was seen all over the U.S. Mrs. Roosevelt's plane ride gave an enormous boost to black aviation. The successful CPT under Anderson's leadership was a major factor in the Army Air Corps decision to establish a primary training program at Tuskegee. As chief flight instructor at Tuskegee, he supervised primary flight training for 1,000 African-American pilots at Moton Field.